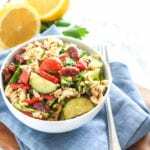 Just as some avidly follow fashion trends, celebrity gossip and sports, my love for following health and wellness trends runs deep. 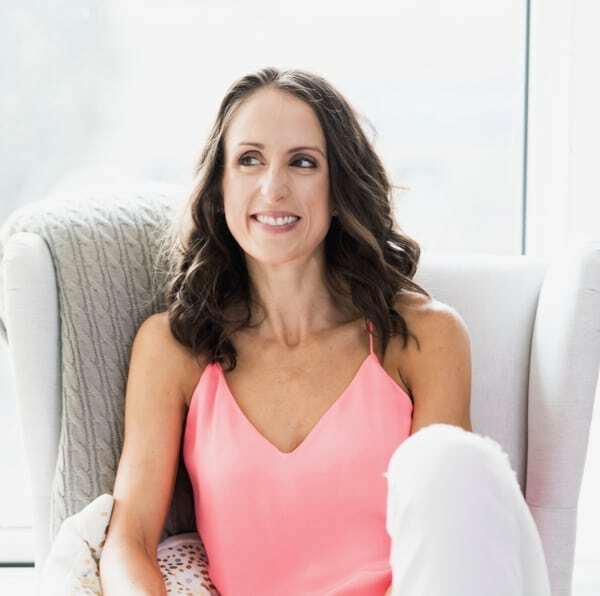 The holistic wellness coach and culinary nutrition expert in me loves to see how functional foods are being used in new ways, and watching how they emerge from being super niche to mainstream. On the other hand, the marketer in me is fascinated by how these concepts are packaged, advertised and sold. If your idea of a fun weekend involves spending far longer than the average person at Whole Foods, I’m sure you can identify with some of these interests. I spent this past weekend at CHFA West, the annual natural health and wellness industry trade show hosted by the Canadian Health Food Association. 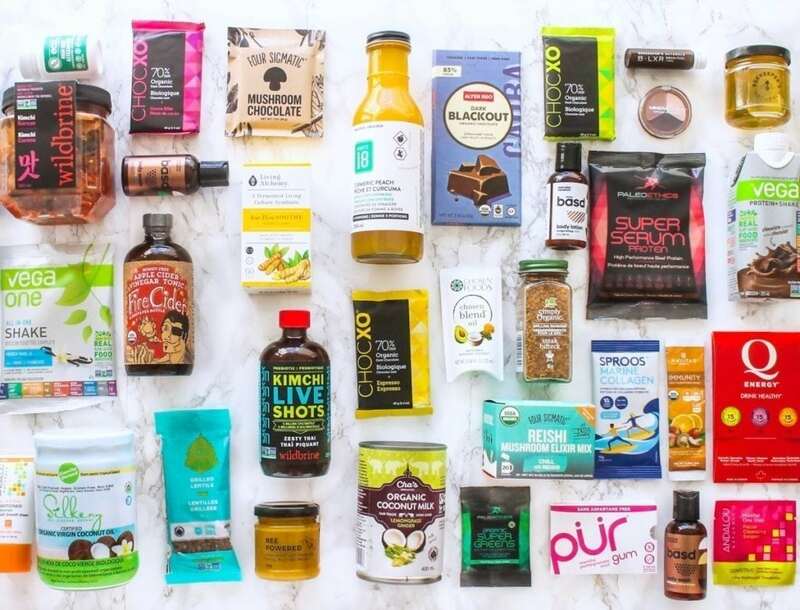 Having attended for 8 years, it’s always one of my favourite events for getting a glimpse at what’s to come with natural foods, supplements and personal care. 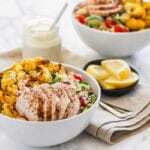 You may have caught a glimpse in my stories over on the gram, but in case you missed them, the following is a roundup of the trends and highlights from CHFA West 2018 that got me excited this year. I first heard the story of Carly, founder of Beekeeper’s Naturals on a podcast a few months ago and the company has been in the back of my mind ever since. Aside from raw honey for face masks and no-bake baking, bee products aren’t something I use often. That’s about to change though, because Beekeeper’s Naturals hooked me up with a few that I can’t wait to use. B.LIXR Brain Fuel – This is a nootropic formula that helps to enhance concentration, mental focus, memory and energy. The main bee product is royal jelly, known for its ability to help clear up brain fog and fight inflammation. 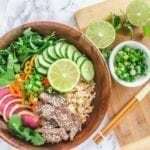 The other ingredients are plant extracts with adaptogenic properties, and the tonic is free of sugar, gluten, wheat, yeast, corn, soya, dairy, and eggs. Bee Powered – This is a triple hit of bee goodness – royal jelly, bee pollen and bee propolis extract – for full body support. While royal jelly supports the brain, bee pollen is where bees get their protein from. It’s also a rich source of vitamin B (among many other vitamins) which we need for energy production. Propolis is the immune system’s best friend because it has antibacterial, anti-inflammatory, antiviral and anti-fungal properties. 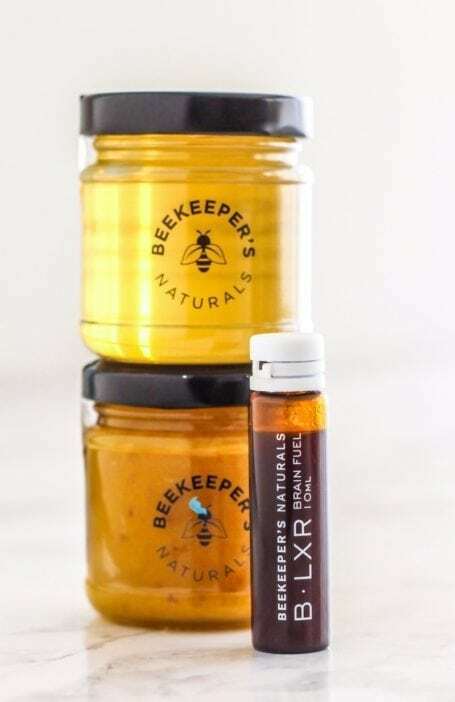 Another reason to love ’em: Beekeeper’s Naturals are Canadian and B Corp certified! 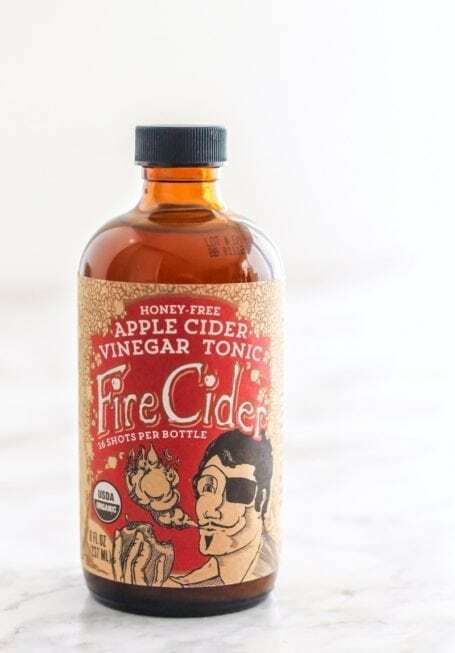 All flavours have a raw apple cider vinegar base, plus a blend of certified organic vegetables, roots, and fruits. With ginger, horseradish, turmeric, garlic and peppers, one 1-tbsp shot is a great thing to knock back pre-meal because it fires up the digestive system – hence the name. I definitely felt a little warming sensation in my stomach about 10 seconds after drinking it, and would describe the taste as tangy, spicy, and very subtly sweet. Cha’s Organics is hands-down my favourite coconut milk, and if you open up my spice drawer, you’ll find dozens of their cute little spice boxes. Back when I started getting into making my own curry powders and other blends, they were the first brand I found that offered such a wide variety of organic, whole spices. One that I adore the taste of but don’t cook with often (because it’s kinda high-maintenance) is lemongrass. 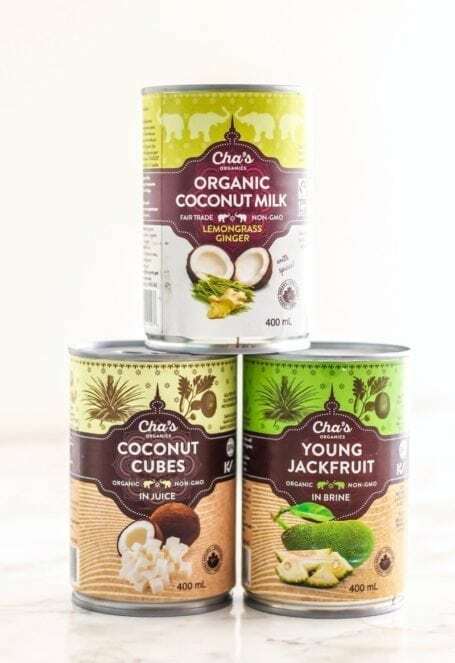 Lucky for me, Cha’s Organics has incorporated it into one variety of their coconut milk, and I can’t wait to whip up a cozy, super-fragrant and flavourful curry with this! Cha’s Organics’ spices and coconuts are all grown on biodiverse, small and medium scale family-owned organic farms. 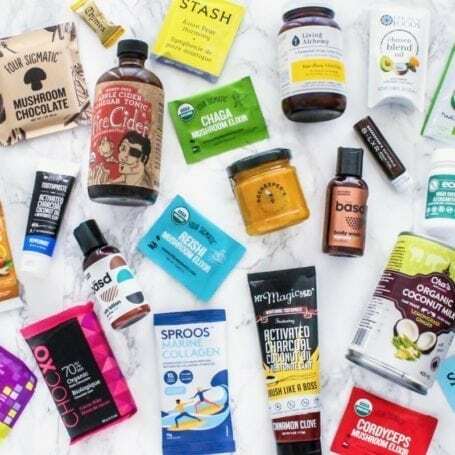 Their products have been Fair Trade since the day the business began, ensuring that the farmers who provide nourishing food to feed our families also have the resources to support their own. support organic agriculture and fair trade principles. There was a heck of a lot of coconutty things at CHFA West – this year, and in the years prior. From chips and water to far more processed variations, I’m not sure there’s much that hasn’t been done with it yet. But being the purist that I tend to be, my favourite way to use and consume coconut is still in its unadulterated form – coconut oil and coconut milk. Sometimes simplicity trumps innovation, ya know? When the people at the Silkeny booth insisted that I try their coconut oil, I only agreed because my hands were dry and in need of moisture ASAP. The smell was so good that slathering it on my skin turned into tasting, and I’m not exaggerating when I tell you that this was one of the smoothest, silkiest coconut oils I’ve tried to date. Another reason to love it is that unlike some brands, Silkeny’s coconut oil is packaged in glass jars to avoid the potential dangers of chemical leeching that you’d risk with plastic containers. The coconuts are sourced ethically and sustainably from Sri Lanka, and are cold pressed in order to preserve quality, taste, colour and smell. Their tagline just happens to be ‘Eat. Slather. 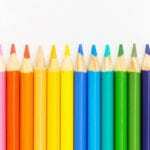 Repeat” and given the name of this blog, perhaps it was a match meant to be! Wildbrine was the brand I selected for my first foray into kraut and kimchi about 3 years ago. 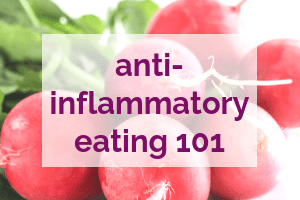 Knowing what I did about probiotics and their benefits, I wanted to find more food sources. However, I had negative preconceived notions about sauerkraut because recalling the smell of the kind my dad used to eat when I was a kid always made me cringe. 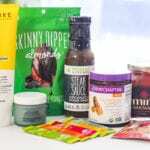 Fast forward to now, and if you open my fridge at any point through the week, you’ll find at least 2 different Wildbrine products inside – most often the krauts, kimchi and gut shots, but also the probiotic salsas. 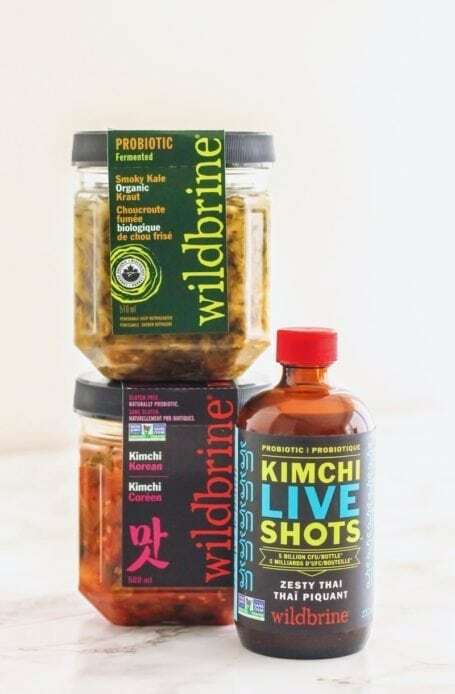 Over time, Wildbrine has developed several new flavours and formats, including twice-fermented kimchi sriracha that puts the regular kind to shame. Whether you like more mild varieties of sauerkraut or really tangy ones that pack a punch of heat, I’d highly recommend starting here. For those who enjoy a pre-meal shot to stimulate digestion, my personal fave is the Thai Lemongrass Live Shot. Collagen is a celebrity in the health food world right now, and I can certainly vouch for its ability to make my nails and hair grow unbelievably fast. 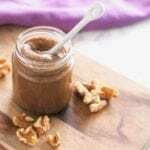 With all of collagen’s reported benefits – gut nourishment, skin health, stronger joints and bones are just a few – it’s an ingredient being added to everything from protein powders to skincare products. What I most appreciated (in addition to SPROOS’ sustainable sourcing of high-quality collagen) was the thoughtful functional ingredient combinations. 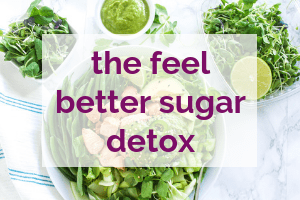 We could supplement with these individual ingredients, or you could get the benefits in a fuss-free drink that also keeps you hydrated. 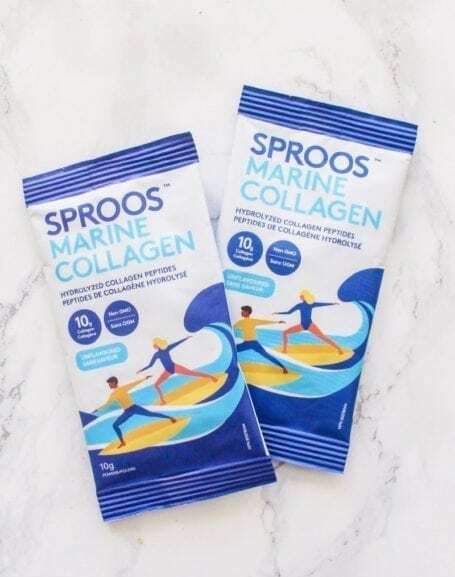 One more perk: these are sold at a more accessible price point than many other collagen supplements tend to be – all without sacrificing ingredient quality. Adaptogen Coffee with Tulsi and Astragalus – as with all the Four Sigmatic mushroom coffees, you get the alertness and mushroom benefits, minus the coffee jitters. Tulsi and astragalus also allow you stay calm under stress and encourage longevity at the same time. Hydration Blend with Tremella – A fruity-tasting product great for hydration during sports, or any time during the day. 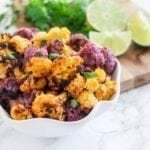 Tremella is a mushroom that is thought to help the body produce more hyaluronic acid, and therefore would have joint and skin-hydrating benefits. This blend also contains sea buckthorn, lemon and acerola, which means it’s got some mega antioxidant superpowers. 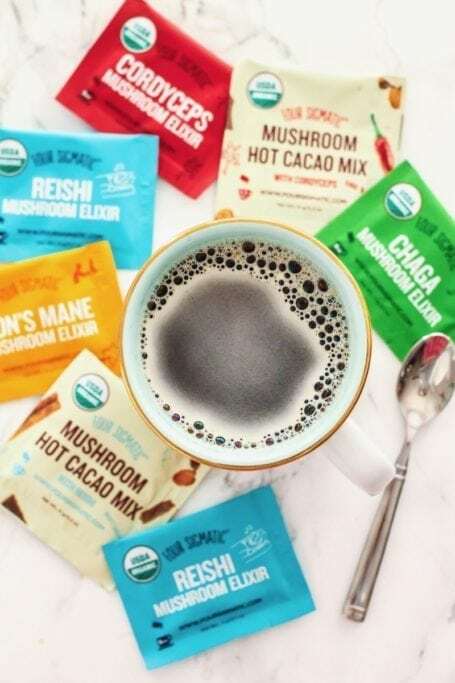 Finally, Four Sigmatic also just came out with a new and improved recipe for the classic Reishi Elixir, with a higher concentration of reishi, added tulsi for an even more chill effect, and no stevia. Guys, this has been my favourite product since the very beginning, and having just received a fresh shipment (because a mug of reishi is an every-evening ritual in this house), I can 100% attest to the effectiveness of this. If you find yourself feeling stressed and irritable after a day at work, or if you have trouble sleeping, it’s a must-try. You can grab it on Amazon here. 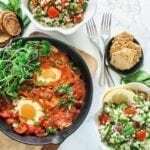 Living Alchemy: And you thought probiotics were good…. Gut health is talked about everywhere right now, and if you take any supplements on a regular basis, I’m willing to bet that a probiotic might be one of them. (It is for me, although I think fermented foods are far more tasty!) 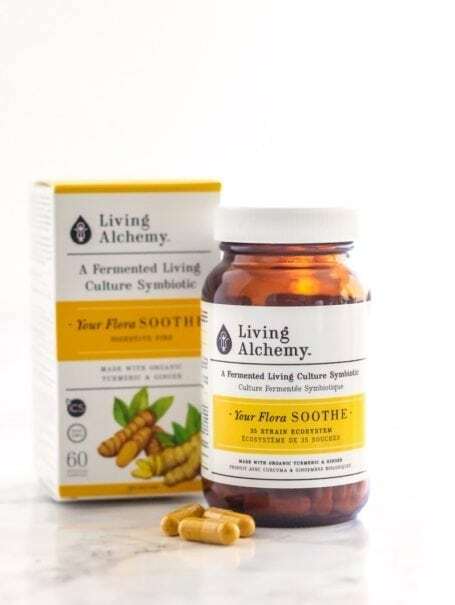 One of my hands-down best finds at CHFA was Living Alchemy, which I initially assumed was just another probiotic line. What I thought would be a quick scan through the products became a long conversation with an amazing woman at the booth who was just as keen to nerd out on the gut and fermentation as I was – which was a lot! It seems there’s a bazillion supplement companies out there right now, and while I’m not fluent on the legalities of starting one, I do know that there are a questionable claims being made. I also know that a good sign of a credible supplement provider is one that has been around for a long time. Advanced Orthomolecular Research (AOR) is an example. The company was first to bring glucosamine sulfate to Canada in 1993, and has since developed a reputation as the most advanced supplement formulator in the country. AOR places massive emphasis on research and transparency, which is probably why they’re trusted by practitioners across the country, and now worldwide with their expansion into the UK and US. What drew me over to AOR’s booth wasn’t so much their products, but their zen-like green display. (I actually just wanted to set my heavy bags down and relax for a few minutes!) 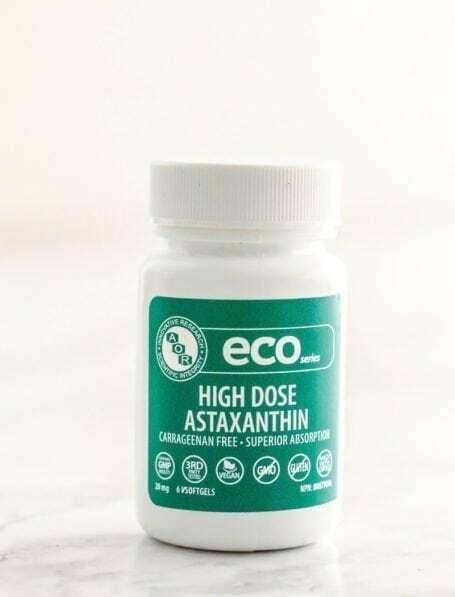 I soon learned that all of the greenery was part of the launch of their new Eco Series, which is probably more eco-friendly than you’ve ever seen with any other supplement brand – with the same level of efficacy as the brand’s supplements have become known for. Everything from the ingredients in the supplements, the capsules, the bottles, and even the labels – have been produced with the needs of the end user and the environment in mind. As I said, supplement companies are everywhere and just like in any industry, it’s tempting to cut corners to cut costs. What I appreciate most about AOR is their commitments to science-backed supplements that work, and corporate social responsibility. My friend Trevor turned me on to My Magic Mud’s charcoal tooth powder two years ago when he heard me complaining about wanting to whiten my teeth. At the time I was a skeptical Colgate-loving girl and couldn’t give up that minty fresh feeling. How could putting black powder on my teeth possibly turn them white? Times have changed – and so have the contents of my bathroom cabinet. 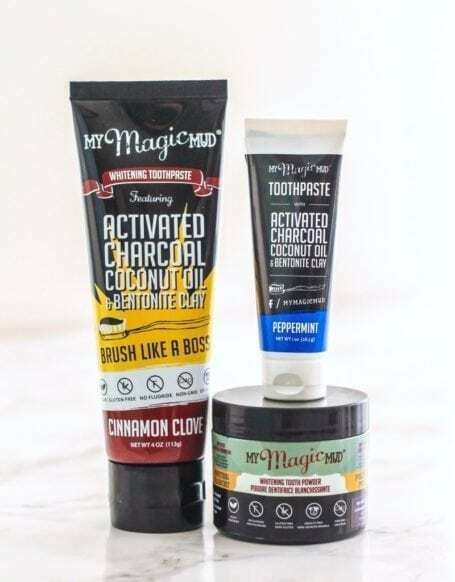 I’ve used My Magic Mud’s toothpaste and powder for whitening and general teeth brushing, but new products at CHFA this year were their oral rinse and Turmeric & Cacao Tooth Powders. The oral rinse is a gentle, alcohol-free version of mouthwash, which is one of the only conventional products I’ve yet to replace. The Turmeric & Cacao Tooth Powder has a similar whitening and polishing effect as the original tooth powder, but the soothing properties of turmeric and cacao are meant to help those who also have sensitive gums. Admittedly, I haven’t been the most consistent about my charcoal-based oral care recently because it’s undoubtedly a more messy process than using regular toothpaste. But after having been re-schooled on the why behind its effectiveness – and being reassured that I won’t strip the enamel off my teeth – I’m going to commit to giving it another go. 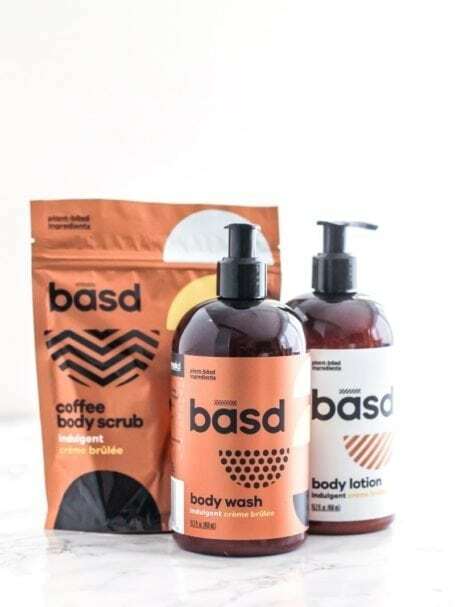 Ingredients aside, these guys have my heart with their brand message, which is that we should be comfortable in our own skin, and our own brand of beautiful. The founders state that they want to be remembered for how they make people feel, as opposed to how the world thinks we should look. If you ask me, the world needs more companies like this, and I’m bāsd’s latest fan. Phew, that was a BIG one. Thanks for sticking it out till the end. I hope that in reading this, a few things have caught your eye and piqued your curiosity. I’d love to hear what those are, as well as any other brands you know of that are up to great things. Tell me in the comments below! That’s the collagen I went with after reading your article actually! I’ve only had it for a few weeks, but I think it’s making a difference!